Casting has been announced for the highly anticipated West End return of The Curious Incident of the Dog in the Night-Time. The award winning play opens on 29 November 2018 at the Piccadilly Theatre. The Curious Incident of the Dog in the Night-Time cast is set to star Joshua Jenkins in his West End stage debut as Christopher Boone, returning to the role from the UK and international tour. Starring alongside Jenkins are Craig Stein (Fatherland) as Mr Thompson, Eliza Collings (The Other Place) as Mrs Shears, Emma Beattie (The Last of the Haussmans) as Judy, Gemma Knight Jones (The Lion King) as Punk Girl, Julie Hale (Cured) as Siobhan, Lynette Clarke (Karagula) as Mrs Alexander, Sean McKenzie (Two) as Reverend Peters and Stuart Laing (Peckham: The Soap Opera) as Ed. The role of Christopher will also be portrayed by Sam Newton for certain performances. Understudies for the play include Emma-Jane Goodwin, Joe Rising, Kieran Garland, and Rose Riley. Based on the 2003 Mark Haddon novel of the same name, The Curious Incident of the Dog in the Night-Time follows Christopher Boone, a 15-year-old mathematical genius who just so happens to be on the spectrum. One fateful evening, Christopher discovers that the neighbour’s dog has been brutally murdered with a garden fork. Determined to solve the history himself, Christopher ventures farther than he ever has before while forced to overcome the limitations of his disorder. Presented as a play-within-play narrated by Christopher’s teacher who reads his detective’s notebook, The Curious Incident of the Dog in the Night-Time is a unique experience that uses jarring sounds and lights to create the illusion of autism spectrum disorder for the audience as they see the world through Christopher’s eyes. The show’s original run in 2012 garnered seven Olivier Awards, including Best New Play, Best Actor for Luke Treadaway as Christopher, and Best Sound and Lighting Design, among others. Its 2015 Broadway transfer won 5 Tony Awards, including Best Play. 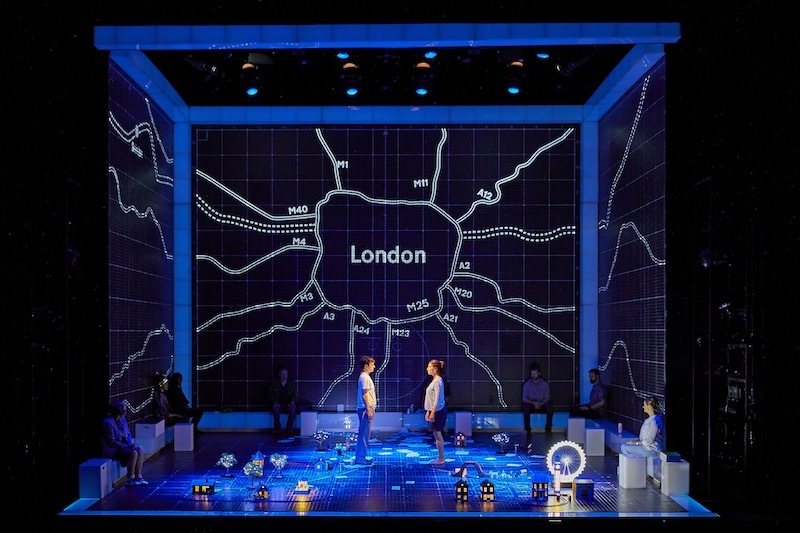 The Curious Incident of the Dog in the Night-Time was adapted by Simon Stephens and is directed Marianne Elliott. It is booking at London’s Piccadilly Theatre from 29 November through 27 April 2019 and comes before the highly anticipated West End transfer of The Lehman Trilogy. Arguably one of the most successful books to be made into a West End show, The Curious Incident of the Dog in the Night-Time is not something you want to pass up. Tickets to the award-winning play are selling fast. Be sure to book your tickets sharpish! Purchase you’re tickets to The Curious Incident of the Dog in the Night-Time at the Piccadilly Theatre.